During a snowy, windy, and cold January weekend I spend the night in the wilderness of Alberta, Canada. I locate my camp in an area that is thick with willow shrubs and evergreen trees to help block the wind. 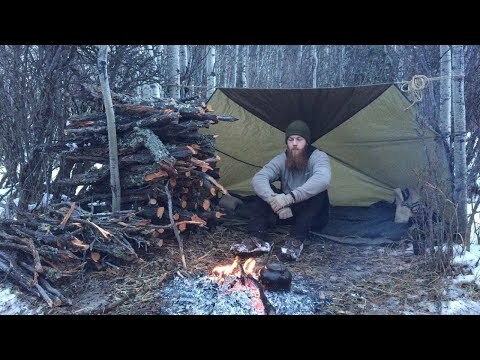 Setting up an open tarp-shelter allows me to keep a fire going all night which aids in keeping me warm. I cook up a garlic butter shrimp fried rice dish for supper, then finish with a mini apple cobbler dessert. I sleep peacefully next to my fire, and under two wool blankets stay pleasantly warm. In the morning I cook a bacon and egg baked potato for breakfast before packing up my camp and returning home. Thanks to all who watch, I appreciate your support. Don't forget to comment, like, and subscribe. Follow me on instagram @ryleyk4 for exclusive content and frequent updates.